A discounted Pier 1 gift card is a brilliant way to buy the stylish housewares you desire without spending too much money. Known for their impressive array of contemporary imported furnishings and décor, you are sure to find far more than you need! From gorgeous dinnerware, linens, and gifts to furniture items, they carry everything you need for your home or apartment. So, what are you waiting for? Get your card today and enjoy shopping in one of America’s most loved stores for less money than ever before! 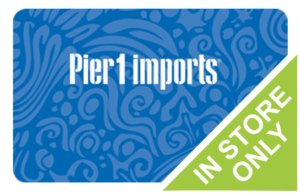 For over 56 years Pier 1 has offered beautiful housewares with distinctive style and functionality. Whether you are shopping for curtains, rugs, lighting, or furniture, you will find everything you are looking for and more. And the great news is, you can now buy a Pier 1 gift card at a discounted price and save money on every single item! This means your dollar will go further than ever before on fantastic imported furnishings, gifts and more! Get your card today and shop to your heart’s content, without breaking the bank! A discounted Pier 1 gift card, will save you money on your entire purchase. What’s more, you can use your card in any of their 1,000+ United States locations. Shop once, or time and again and save money every time. Furthermore, because gift cards are a form of currency, all other store promotions and discounts remain! Shopping for elegant furnishings and housewares has never been so affordable! Isn’t it about time to update your dinnerware? What better way than by using a discounted Pier 1 gift card? With it, your dollar will stretch further than ever before! Whether shopping for apartment or home, this is the perfect store to find imported furnishings that give every room a unique flair. And now you can get the same great merchandise for less money! But that’s not all. Cards2Cash offers lots of other discounted cards. Be sure to check out our listings for Pottery Barn, Bath & Body Works, Home Goods, TJ Maxx, and more! With Cards2Cash on your side, fashion is affordable! If you have a Pier 1 gift card that you are not going to use, then consider selling it to Cards2Cash. We buy gift cards for lots of retail stores and restaurants. And the very best part is, we pay top dollar for them! If you would like to turn your card into money, then stop in one of our retail locations, and we’ll pay you cash right on the spot. Or just fill out our secure online form, and we’ll quickly get back to you with an offer for your card! Either way, Cards2Cash is your one-stop stop gift card shop!